The artist's paintings at Roy Boyd Gallery give voice to a long-simmering struggle with the church. Richard Gibbons is a Chicago architect and figurative painter obsessed with the sculptural form of the human body. Most of his work has been cool, nearly abstract, and devoid of narrative except for what the viewer might supply. 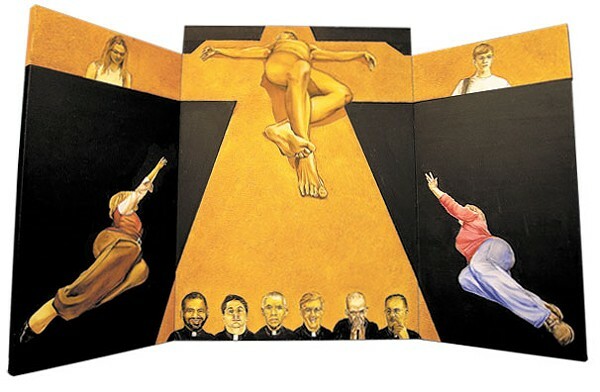 But his current show, "Confession," at Roy Boyd Gallery is a departure—a group of contemporary religious paintings, including three large triptychs, that give voice to a long-simmering struggle with the Roman Catholicism in which he was raised. Gibbons's models were his friends. In the triptych Prey, we see Jane Gardner and Andrea Murphy as the Blessed Virgin and Mary Magdalene, respectively, reaching in vain across a vast black gap toward a towering cross while a rogue's gallery of dishonored priests stands smirking at its base. 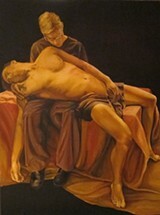 In Conflexion, the central image of the show, Marco Gonzales is Jesus, slumped across the lap of Gibbons himself in a version of the pieta that's all about confusion and dismay. These are paintings as unabashedly didactic as the Renaissance art they reference. Here's the story behind them, in Gibbons's own words. "I started on this series almost a year ago, but I was thinking about the ideas behind it my whole life. "I'm from Maumee, Ohio, a small town near Toledo. My parents were observant, and I went to Catholic schools, right through to Notre Dame. "I stopped being an observant Catholic at 18 or so, disenchanted with the message. Not the Christian message, but the Catholic message: 'If you don't do this, if you keep thinking gay thoughts, you will go to hell, and you will be punished.' But it goes way beyond the whole gay issue. The church has been on the wrong side of many issues. There's the Crusades. And the Inquisition. "In the early 1970s I spent two years as a student in Rome, and then worked there for another year. Where I lived, in the piazza on Campo de' Fiori, there was a huge statue of Giordano Bruno. He was burned at the stake by the Catholic church for believing that the earth revolves around the sun. On that piazza. Now it's a fruit and vegetable market. "It doesn't help when a pope goes to Africa, preaching against using condoms to stop the spread of AIDS. There's the restrictions on women, and the sexual abuse they handled by trying to hush it up. I don't think they cared about the victims. They cared about the organization. It was a club. They had loyalty to themselves, the member priests. Christ is being recrucified by his supposed followers, the clergy. "Sometimes I've wondered how different things would have been if I hadn't had such a strict Catholic upbringing. Without any rancor, I think I can say that I would have had a much better life. My whole experience was about punishment. I've spent a lifetime trying to overcome the damage. "I think any kind of fundamentalism is dangerous. Anything that says there's only one way to heaven, and it's through me. I was told that it was a mortal sin even to go into another church. But when you get exposed to other religions and other people, you realize humanistic principles should dominate our behavior. Good acts for their own sake. These people are not going to hell because they're not Catholics. They're good people. "The realization that the Catholic church doesn't own the message of Christ, that was huge for me to understand. "Religious art is narrative art. I'd never done that before, never tried to tell a story, but once these images crystallized, and I got the right people, and exactly what I wanted to say, I couldn't stop painting, it flowed out of me. "I think I've just scratched the surface of it. It's not just about exposing abuses. It's more about letting myself as well as other people know that it's OK to leave the Catholic church. You don't have to lose religion. You can still believe the Christian message. And you will not be damned." Correction: This article has been amended to correctly reflect that the art featured is provided courtesy of Roy Boyd Gallery. A breakaway Catholic church flings its doors open wide. Illinois joins 19 other states and DC in a lawsuit that challenges changes to Title X as unconstitutional. The entire orchestra will play together in Woodlawn. In Rita Kalnejais's modern fable, parents pass on their prejudices to their children.